Earlier this year, Samsung revealed a refresh of its well-regarded 2017 Chromebook Plus. The new Chromebook Plus (V2) had an unadventurous name, but it had most of what made the original great, sadly sacrificing its incredible display for a faster Y-series Celeron (read: not one of the bad ones). Now Samsung has further revealed an LTE-equipped version of the V2. The extra connectivity comes at a $100 premium, though. The new model is $599, available November 2nd. So far as we can tell, the new model is otherwise identical to the previous V2, with the same 1080p 12.2" 300nit display, Intel Celeron 3965Y, 4GB RAM, 32GB Storage, and 39Wh battery. For more hardware details, you can see our coverage of the V2's announcement. Details like LTE bands and carrier compatibility haven't been provided either, though it will be available from Verizon — presumably meaning it supports that carrier in the US, at a minimum. Samsung also claims to have worked together with Intel and Google in the creation of the V2 LTE. A quote from Josh Newman (general manager of Mobile PC Segments at Intel) reveals that there's very probably an Intel modem inside the Chromebook: "Samsung’s new Chromebook Plus V2 (LTE) device meets this expectation with style by fusing Samsung design ingenuity and Google’s beloved OS with Intel processors and Intel LTE connectivity." Chromebook-loving road warriors can get their LTE-enabled fix on November 2nd for $599. In addition to Verizon, it will also be sold at Best Buy and Samsung's site. People who never stop moving need technology that not only matches their pace, but also magnifies their effort. They need a laptop that goes where they go, and keeps them connected and productive. At Samsung, we believe they deserve their choice of device that suits them best. Instead of one-size-fits-all, we take a different approach—creating a range of devices to meet the needs of different consumers. We offer super-powerful, top-tier laptops and tablets. And we also bring premium features down to more affordable price points. Whether a consumer prefers Windows, Android, or Chrome OS, we want to make sure Samsung has the device that helps users get more out of their life and work. Looking out at the PC market right now, we see that demand for Chrome OS continues to grow. Consumers value having a laptop that boots up practically instantly, it has antivirus built-in and gets users right into the internet-based apps and services they rely on the most. It’s how they connect with friends, stream songs and videos, create, edit, and save their work in the cloud. Today, a rising generation is taking this operating system with them from the lecture hall into their homes, offices and the rest of their lives. Whether they’re on a work trip or traveling the world, they should be able to stay securely connected from wherever they are. And now, they can. Introducing the Samsung Chromebook Plus V2 (LTE). 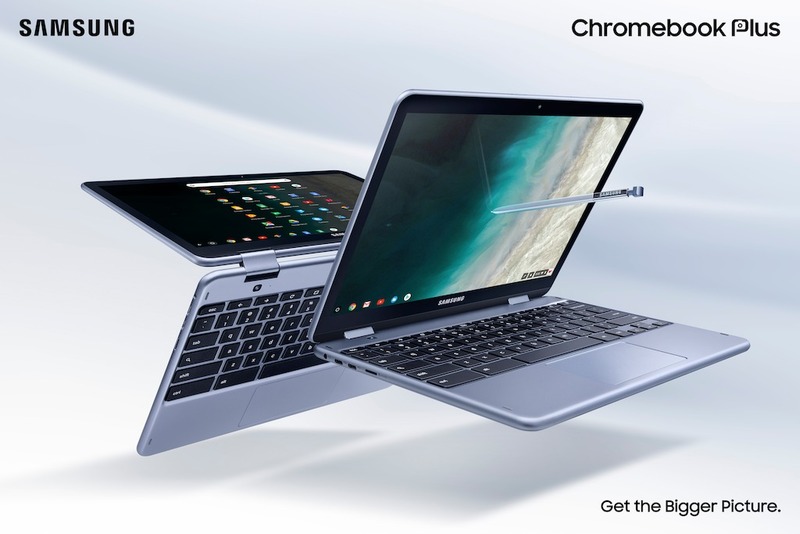 With it, we’re delivering a premium Chromebook, at a competitive price point that addresses the need for on-the-go internet connectivity. The lightweight 2-in-1 Samsung Chromebook Plus V2 (LTE) helps consumers get more done anywhere, anytime, without having to search for Wi-Fi. 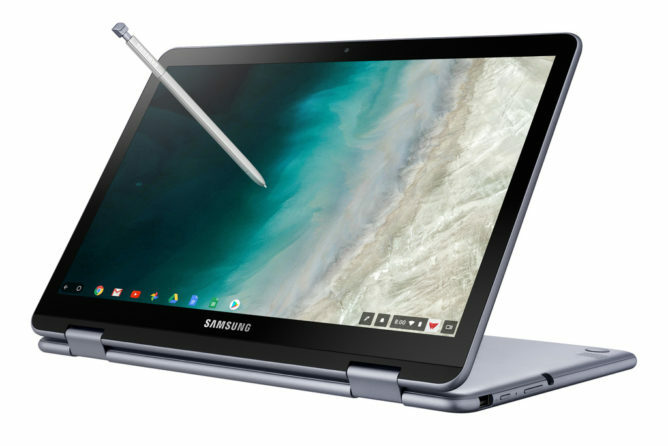 The range of technologies that went into creating the Samsung Chromebook Plus V2 (LTE) are not only from Samsung, but also from Google and Intel. Samsung brought it all together with lightweight, durable design and a premium look and feel—as well as the built-in pen and two cameras—so users can slip the Samsung Chromebook Plus V2 (LTE) into their bag, bring it out in their most important meetings, and use it for the most important things they want to accomplish in their day. When innovation powerhouses come together, as Samsung, Google, and Intel have many times over many years, we’re able to meet consumers’ needs in ways we haven’t been able to before. With the Samsung Chromebook Plus V2 (LTE), we’re bringing to market a premium device at an affordable price. Fittingly, it’s one that will help consumers do things they weren’t able to do before—to connect their primary devices, such as Chromebooks, wherever and whenever. The Samsung Chromebook Plus V2 (LTE) will be available for $599.99 starting November 2, 2018 at Samsung.com. It will also be available Best Buy and Verizon. Samsung sure doesn't want anyone forgetting about the retail debut of its new LTE-equipped Chromebook, and this morning sent out a new press release reminding us of the start of sales. Just as we mentioned before, shoppers can pick up the Samsung Chromebook Plus V2 (LTE) at Best Buy, Verizon, or directly from Samsung's website for a hair under $600. Consider yourself reminded.